Inmate Dario Pena plays Macbeth in the Shakespeare play staged at the infamous Sing Sing prison upstate. This troupe performs for a truly captive audience. A cast of Sing Sing inmates just did Shakespeare for their cellmates, putting on a jailhouse production of "Macbeth" where a convicted killer played the murderous title king. "The character just jumped out at me," said actor-inmate Dario Pena, who played the lead complete with sword and crown. "I could identify. I saw a lot of myself in the character." The drama was the 22nd production of Rehabilitation Through the Arts (RTA), a privately funded program founded in 1996. The three-night stand of "Macbeth" this month included two inmates-only shows, with a third open to invited guests. "RTA has saved my life," said inmate Brian (Spider) LaBrosse. "I would be out in the yard being a bonehead ... instead of being here with these good brothers." The program runs year-round inside the imposing prison overlooking the Hudson River, putting on two shows annually. There was some debate about doing "Macbeth," with its dark plot of murder and betrayal. Inmate David Allweiss, 57, thought it was a perfect choice. "You can choose your rebellion, but you can't choose your consequences," said Allweiss, jailed since September 1974. "That is what 'Macbeth' is about." For Allweiss, who portrayed one of the play's three witches, this might be his last performance. The convict is due before the parole board in July. RTA founderKatherine Vockinssaid the program achieves four goals: breaking down racial stereotypes, nurturing creativity, sending a positive message to inmates and raising awareness beyond the prison walls. The plays also do more than provide a diversion for the incarcerated. A report on the program found participants showed better coping and anger management skills than the average inmate. That was the case for Clarence Maclin, who played murder victim Banquo in "Macbeth." "We teach life skills here," he said. "We're not making actors. We're building life skills that you can take over the wall." The message is sent to family and friends waiting for an inmate to finish his jail time. "Because of RTA, I can proudly show people in my life that I am truly ready to be the father, husband, son, brother and example they can count on," Maclin said. The cast and crew forge through peculiar impediments in their way, way-off Broadway productions. A "Macbeth" rehearsal was interrupted by the booming voice of a correction officer assembling the inmates for count time - a check to make sure the prisoners are all there. "Prison!" Maclin complained. "They're always interrupting the thought process." Provided: All of the necessary supplies including rods, reels and bait, as well as formal instruction. Fishing poles are provided on a first come, first served basis, with a half-hour limit when others are waiting. Big City Fishing is an important tradition at Hudson River Park. The program gives anyone and everyone the chance to fish, and is appropriate and fun for those as young as five. Beyond learning to fish, the program also provides participants with a first hand opportunity to learn about the Hudson River environment. In a typical session, Trust staff offer a brief introduction to ecology and water quality, followed by an overview of the many fish species that live in Hudson River Park’s Estuarine Sanctuary. Visitors are also able to view plankton through microscopes; to examine live specimens – caught that morning, either in traps or on someone’s line; and identify species from Hudson River Park’s signature Fish Poster, which is available for purchase by contacting the Trust. Although a NYS fishing license is not required for fishing in this area of the Hudson, there are restrictions on the minimum size of the fish, daily possession limit, and a specified open fishing season for each fish species. Fishing is restricted in certain areas; please call the park for details: 212.627.2020. The once-in-a-lifetime 400th anniversary of Henry Hudson’s historic voyage deserves special recognition – and that’s exactly what it will get at the “The Hudson River Fest: A Search for the Past, Presentand Future” on Sunday, June 7. Families who stop by the Lyndhurst estate in Tarrytown between 10 a.m. and 5 p.m. can join in the “Hudson River Quest,” a scavenger hunt that will get everyone scurrying to search for clues, solve riddles and take part in hands-on activities that explore the last four centuries. And once the kids stop walking on stilts, smelling roses in the Rose Garden, measuring an apple tree or making bookmarks from dried corn, they’ll find even more to look forward to. Live music, an outdoor market featuring locally grown produce, Hudson Valley wineries and cheese makers, and more than 40 interactive displays and exhibits by environmental groups and arts organizations will headline the event. Check out an exhibit of floatable trash, an observation beehive, a visiting Arctic gray wolf, a collection of clothing from 1909, and old fashioned toys kids can really play with. The program, which highlights the natural, cultural and historical significance of the Hudson River, is sponsored by Westchester County government and Lyndhurst, with assistance from the county’s Parks Department and Office of Tourism and the New York State Hudson-Fulton-Champlain Quadricentennial Commission. The signature event -- the Hudson River “Quest” -- will help young adventurers learn more about the Hudson River while having fun. With a Quest booklet in hand, they can visit as many of the 11 stops scattered throughout the property as they like. Each page of the booklet represents a clue on the quest by describing fun facts about life and history around the Hudson River along with a poem and hands-on activity to complete. With the help of "Wes Quester" and "Crabby Blue," kids collect stamps and fill up the booklet. Native American/Celtic author Evan Pritchard will reconstruct the events surrounding the Half Moon's journey of 1609, and share with his insights into the probable significance of Henry Hudson’s Algonquin hosts. Tours of the Lyndhurst Rose Garden in full bloom. Presentations by well-known historians, scientists, authors and folklorists. The Westchester County Veggie Van, a retrofitted vehicle that runs on vegetable oil, will be open for tours. Live animals including an Arctic gray wolf from The Wolf Conservation Center in South Salem and birds of prey from the Greenburgh Nature Center and Teatown Lake Reservation. Nature walks on the Old Croton Aqueduct Trail led by naturalists and conservationists from Westchester County parks and Friends of the Old Croton Aqueduct. Tours of the Lyndhurst mansion (additional fee). Preview of the Hudson RiverWalk. Food will be available for sale. There is suggested entry donation of $5 for adults and children over 12. Free parking is available at Lyndhurst and Kraft Foods.Visitors traveling by train can take the Metro North Hudson Line to the Irvington station, where a shuttle bus will be provided by the Village of Irvington to take them to the festivties. You ca confirm shuttle operation arrival and departure times online at Irvingtonny.gov. For more information, call (914) 631-4481 ext. 43222 or (914) 666-4258. Visit the Office of Tourism to learn about other accommodations, dining, travel and other recreational options around Westchester County. Tony Weils climbs aboard as Tom Almy steadies the boat they prepare to launch in Schuylerville for an outing on the Hudson River. CAPITAL REGION — The state Health Department has issued a warning that swimmers downstream from a Hudson River dredging project should wash thoroughly with soap and potable water when they get to shore. Janice Daigle says she’s always bathed after swimming in the Hudson. She’s lived on River Road in the town of Saratoga for 20 years. “I don’t think we’re going to change our habits in the river because of the dredging,” Daigle said. It’s been one week since the long-awaited — and for some deeply dreaded — dredging project began in the Hudson to remove tons of PCB-laden sediment. The $780 million project, if it proceeds after the initial test phase, will take at least six years as it covers “hot spots” from Fort Edward to Troy. The federal government and General Electric Co. spent two decades debating, planning and designing the project to remove the PCBs — polychlorinated biphenyls, which are considered a cancer-causing agent. The whole impact of the dredging on river-related recreation may never be known, but the state Department of Health has strong warnings about swimming downstream from the dredging, and the owner of a local marina said part of her business is already down more than a third from last year. DOH spokeswoman Claire Pospisil said although there are no state-regulated beaches between Fort Edward and Troy, the state urges precautions for anyone planning to swim in the area. She said no one should swim in the immediate vicinity of dredging operations because of the significant volume of boat traffic and equipment. Daigle’s home is about 18 miles south of the initial dredging location and about 500 feet from the Saratoga-Stillwater line. On Thursday morning, she was making last-minute preparations before she and her husband put their speedboat into the river for the season. She said they swim, fish and boat in the Hudson every chance they can, and that’s not going to change because of the PCB removal project. She said it’s been her family’s practice to shower after swimming because the water often smells fishy. She said she didn’t know the state had issued a warning connected to the dredging project. “I guess it may make me a bit squeamish about going in the water, but I think we will still swim when we feel like it,” she said. Pospisil said boaters need to be cautious too. “Recreational boaters should also avoid activities in the immediate vicinity of dredge operations. When turbidity is high downstream of dredge operations, this could suggest that there is elevated resuspension of potentially PCB-contaminated sediment and higher levels of PCBs in the river water as compared to background,” she said. That’s troublesome for Judy and Phil Dean, who own the Schuyler Yacht Basin in Schuylerville. Judy Dean said the business depends on long- and short-term campers and boaters who make the marina their seasonal homes. Dean said several regular seasonal customers have told her they will go somewhere else this summer to avoid the expected inconveniences of the dredging project. Most of those boaters live within an hour’s drive of the marina and stay on their vessels on weekends and during vacations from work. Dean said her customers apologized but said they will dock their boats in lakes this summer and see how things go on the Hudson. “They’re concerned about being able to navigate and about the pollution that’s going to be stirred up,” she said. Some of the visitors to the marina stay only a night or weekend. Dean said the so-called transient reservations for boat slips and RV sites are also down significantly. She admitted the rising cost of gas and general economic malaise are also likely to hurt business. “Under normal circumstances, we get calls that three, four or five boats will be coming in for a long weekend and they want a reservation. We’re not getting those calls this year, but maybe they will come at the last minute,” she said. As a member of the Saratoga County Chamber of Commerce, Julia Stokes was on the advisory committee that considered tourism impacts before the dredging project began. She said navigational problems for commercial and recreational boaters were a huge concern as there will be times when barges loaded with polluted sediment will be passing through the lock at Fort Edward. The solution is a Web site boaters can access before they travel near the dredging operations, www.hudsondredging.com. The site will update locations of the equipment in the river and the best route around them. Currently operations are around Rogers Island and Lock 7 of the Champlain Canal and the eastern channel of Griffin Island between Washington and Saratoga counties. Worries about exposure to PCBs are not isolated with river water and despite decades of research, studies are continuing. Stokes said concerns that PCBs are on the shore and throughout the flood plain of the river create another fear. Miles of hiking and biking trails have been created on old tow paths along the river. Stokes said there is no evidence those activities raise health issues. 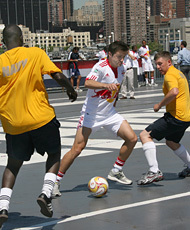 G. Paul Burnett/The New York TimesMembers of the Red Bulls faced off against Navy personnel on the deck of the U.S.S. Intrepid. It may not have been soccer on the high seas, but it was small-sided games high on the deck of the U.S.S. Intrepid on the Far West Side of Manhattan on Thursday. 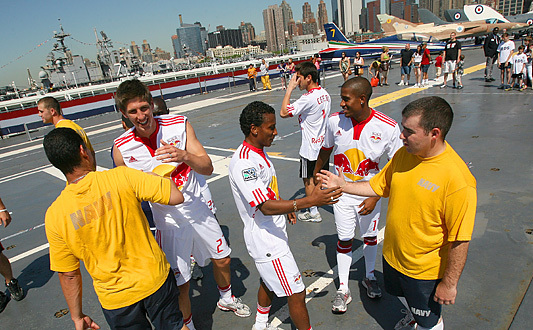 The Red Bulls of Major League Soccer played a team of United States Navy personnel from the Aegis guided missile destroyer, U.S.S. Roosevelt (DDG 80), as part of the 24th annual Fleet Week in New York harbor. About a dozen Roosevelt crew members took part in the game with all the Red Bulls players on hand after Wednesday night’s 5-3 loss to D.C. United in aU.S. Open Cup game in Washington. The Roosevelt, whose home is at the Naval Station Mayport in Jacksonville, Fla., recently returned from a seven-month stint with the Fifth Fleet of the United States Navy in the Persian Gulf area of the Middle East. G. Paul Burnett/The New York TimesNo. 8 for the Red Bulls, Sinisa Ubiparipovic, moved past Navy defense. One of the Roosevelt’s players, the culinary specialist Juan Otero, 24, was born in Mexico but moved to the United States when he was 5 years old. He grew up across the Hudson (and Passaic) rivers in Passaic, N.J. He has been in the Navy for the past five years and said he plans to re-enlist when his tour is up in a year. Fleet Week has been a Memorial Day fixture in New York since 1984, and the Intrepid Sea-Air-Space Museum has been the focal point in all but two years, when the World War II-era aircraft carrier was being renovated in dry dock in Bayonne, N.J., and Staten Island in from 2006 to 2008. This week more than 3,000 Naval and Marine personnel are in New York for Fleet Week, and the ships moored on the Far West Side are open to the public until late Tuesday. No one was keeping score as the players were divided into sides for two separate games. One game was scoreless until Red Bulls goalkeeper Jon Conway sauntered on to the “field” and quickly scored two goals. “Two touches, two goals,” Conway said. Then addressing striker Juan Pablo Angel, who sat out the matches, Conway said, “Hey, Juan, they ought to pay me the big bucks!” Angel is the team’s highest-paid player. After the games, the Red Bulls presented the Navy players with tickets to Sunday afternoon’s match against the Chicago Fire at Giants Stadium (the club will recognize members of the military with an on-field ceremony as part of its Tickets for Troops program), balls that the players autographed and replica team jerseys. Explanation: East of Antares, dark markings sprawl through crowded star fields toward the center of our Milky Way Galaxy. Cataloged in the early 20th century by astronomerE. E. Barnard, the obscuring interstellar dust clouds include B59, B72, B77 and B78, seen in silhouette against the starry background. 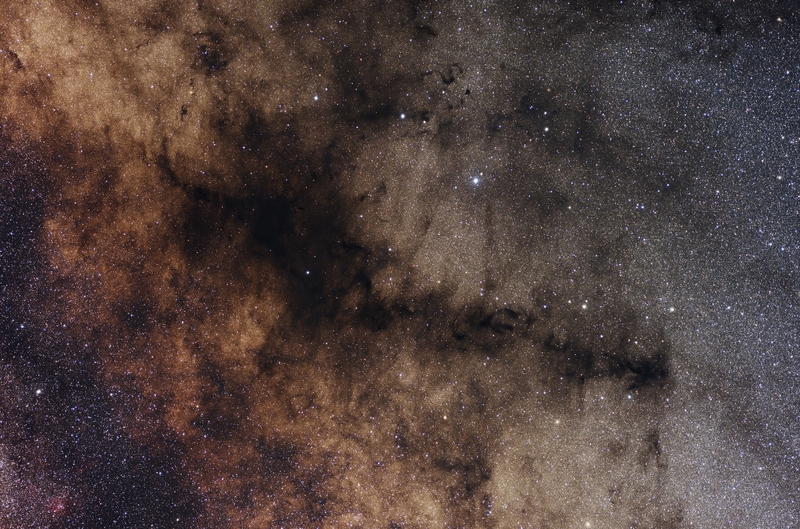 Here, their combined shape suggests a pipestem and bowl, and so the dark nebula's popular name is the Pipe Nebula. The deep and expansive view was recorded in very dark Chilean skies. It covers a full 10 by 7 degree field in the pronounceable constellation Ophiuchus. The Pipe Nebula is part of the Ophiuchus dark cloud complex located at a distance of about 450 light-years. Dense cores of gas and dust within the Pipe Nebula are collapsing to form stars. Some beaches will have more to offer visitors this summer, while some will have considerably less. A $1.6 million state budget cut means Jones Beach will have 56 fewer lifeguards this summer and will also close the East Bathhouse pool and the West End 2 beach. Also, the Field 1 ocean swimming beach will be open only three major weekends. "The budget reductions were accomplished with the minimal impact on the park visitors," said state parks spokesman George Gorman, who added that there is still plenty of "good news" at the state beaches. But a new 21/2-mile bicycle path along the Wantagh Parkway near Jones Beach was recently completed, Department of Transportation officials said. At Robert Moses, parking at Field 5 will likely be limited this summer because of beach erosion, state parks spokesman George Gorman said. Meanwhile, Nassau County'sNickerson Beach Park in Lido Beach has completed its new volleyball courts. Nassau's Commissioner of Parks and Recreation, Jose Lopez, said the addition is the latest effort to "open it up to families." The beach also has a skate park and dog run. At Long Beach, visitors this summer will, for the first time, be able to rent beach chairs and umbrellas from vendors, who will be at the beach section nearest the Long Island Rail Road station. Long Beach City spokeswoman said the service "will be a good thing for people who don't want to lug stuff down here." There will be no scheduled construction-related closures on any state roads on Long Island this weekend, including the Wantagh State Parkway and Robert Moses Causeway, which are both undergoing major construction projects that have affected travel to and from South Shore beaches. "It's a relatively short construction season, but we do our absolute best to make sure that people can enjoy one of the best things about Long Island, which is the beaches," said Department of Transportation spokeswoman Eileen Peters. Work to replace the old Goose Creek Bridge on the Wantagh Parkway with a fixed span will resume on July 20. Beginning on that date, there will be two travel lanes available in the newly completed northbound bridge span in the peak direction and a single lane in the off-peak direction. On summer weekends, all travel lanes on the Robert Moses Causeway will remain open. On weekdays during the weeks of June 1, 8 and 22, there will be lane closures over the State Boat Channel to install steel curbing and new bridge railing. Also, the Smith Point Bridge on the way to Smith Point County Parkbeaches on Fire Island, is under construction, and has a 10-ton vehicle weight limit, Suffolk County Parks spokeswoman Emily Lauri said. Department of Transportation officials recommend several ways to monitor traffic and reduce the chances of staring at brake lights during your summer drive. The newest among them is the DOT's new 511 phone hotline, which offers up-to-date traffic and closure information. Motorists can also visit 511NY.org. Real-time video and images of state roads on Long Island are also available through the DOT's INFORM service at informny.com and informny.mobi on mobile devices. Summer on Long Island means lots of fun on the beaches, and lots of brake lights on the way to and from them. With this weekend unofficially kicking off the season, several state and local agencies are doing their part to make Long Islanders' trip to the beach as stress-free as possible. The state Department of Transportation promises a "construction-free" Memorial Day weekend and is also offering several resources to check traffic conditions before leaving home. Starting Friday, the LIRR will offer five additional afternoon and evening trains to the Hamptons, terminating in Montauk or Greenport. The LIRR also will begin offering its usual discount combination travel packages to Jones Beach, Fire Island and Long Beach beginning Saturday. The discount packages include bus service to Jones and Robert Moses beaches, admission to Long Beach, and taxi and ferry service to several Fire Island beaches. The packages will be available on Saturdays, Sundays and holidays throughout the summer; and for daily service starting next month. As a cost-savings measure, LIRR weekend eastbound morning summer service to Freeport, usually added to accommodate Jones Beach customers, will not operate this year. And they're off! Competitors take off for the Transportation Alternatives' annual commuter race. When it comes to getting around the city, two wheels are still better than four. For the fifth year in a row, cycling ruled the road in Transportation Alternatives' annual commuter race Thursday, with a biker beating a straphanger and a cabbie. It took librarian Rachel Myers 20 minutes and 15 seconds to pedal 4.2 miles from Sunnyside, Queens, to Columbus Circle during the morning rush. 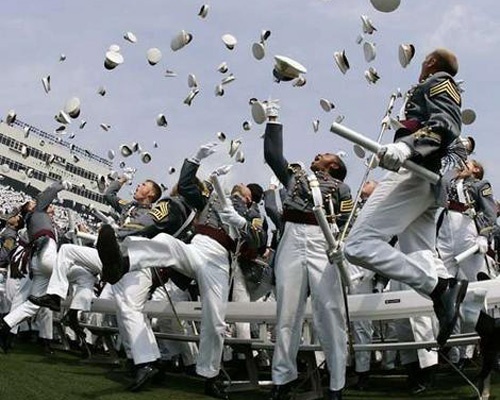 "Woo hoo!" the 29-year-old Brooklynite shouted, pumping her fist in the air. "Just goes to show that bikes rule this city!" Subway rider Dan Hendrick- who hopped the No. 7 in Sunnyside and transferred to the No. 1 at Times Square- arrived 15 minutes later. Hendrick, 38, usually rides the rails to work at the New York League of Conservation Voters, but he may be switching to pedal power. "Twenty minutes saved is a lot in the morning," he said. "I could really use that time to get a latte or something." A yellow cab rolled up to the finish line 27 minutes after Myers, costing passenger Willie Thompson $30 and precious commuting time. "I always thought [cabs] were the fastest," said Thompson, 30, a nonprofit e-marketer from Flatbush,Brooklyn. "But it was so slow, it was brutal. I'm exhausted from sitting so long!" The bike, of course, is also the most environmentally friendly option with no carbon emissions, compared with 2pounds for the subway and 6pounds for the cab. Wiley Norvell of Transportation Alternatives reminded commuters that with more than 600miles of bike paths in the city, cycling is more efficient than ever. "I think there's no commodity more important to New Yorkers than their time," said Norvell. "And clearly, if you've got somewhere to be in a hurry, riding a bike is the way to go." Just because you're stuck in town this weekend doesn’t mean you can’t treat yourself to a mini- vacation — or to some peace and quiet. Put yourself or your out-of-town guests up in luxury lodging. Several New York City hotels are offering discounts on room rates that amount to less than $200 a night — rare for quality lodgings in Manhattan. After getting a $70 million face-lift, the New Yorker Hotel, at W. 34th St. and Eighth Ave., has a summer promotion to show off its new look: 15% off the best available room rates, now through Aug. 31. Nightly rates start at $169 per room, down from about $194 (a savings of $25). Each recently renovated room has new furniture, carpets, wallpaper and Art Deco-inspired interiors, plus complimentary Wi-Fi, flat-panel HDTV, plush bedding — and amazing views of the skyline, including the nearby Empire State Building. Go to NewYorkerHotel.com/Specials.html, or 1-800-764-4680. Weekend rates at the four-starEmpire Hotel, just a half block from Central Park andLincoln Centerin the Columbus Circle area, are now as low as $179 per night (regular rates are as high as $329). After you’re done strolling the park, take a dip in the rooftop pool. (Weekday rates are as low as $159 for Sunday-Thursday stays; $149 any day of the week in July). Rooms feature complimentary wireless Internet access and flat-screen TVs. Call (212) 265-7400 or go to empirehotelnyc.com. The city’s three GEM Hotelsnot only are located in three happening spots — Midtown West, SoHo and Chelsea — each is offering 15% off regular rates with a Sizzling Summer deal. Rooms that usually are $155 a night are now as low as $135. Guest rooms at each of complimentary Internet access, bottled water, iPoddocking stations and high-end Gilchrist & Soames bath amenities.www.TheGEMHotel.com. See the sites like a tourist, courtesy of the Wyndham Garden Hotel Manhattan—Chelsea West’s Subway Shuffle program. Guests receive a complimentary one-day MetroCardto get around town. You may not need them, but the front desk can provide customized subway (or bus) directions on request. The offer is valid all summer (through Labor Day, Sept. 7) for guests staying a minimum of two nights. Rates start at $189 per night. (212) 243-0800 (use promo code SUBWAY).